Download Sync Gateway from the Couchbase downloads page or using wget. When the installation is complete sync_gateway will be running as a service. To stop/start the sync_gateway service, use the following. The config file and logs are located in /home/sync_gateway. You can also run the sync_gateway binary directly from the command line. The binary is installed at /opt/couchbase-sync-gateway/bin/sync_gateway. Download Sync Gateway from the Couchbase downloads page or using the wget. The initctl restart sync_gateway command does not work in CentOS 6. To restart Sync Gateway, the stop/start commands can be used instead. Download Sync Gateway from the Couchbase downloads page. Open the installer and follow the instructions. If the installation was successful you will see the following. Sync Gateway runs as a service (reachable on http://localhost:4985). To stop/start the service, you can use the Services application (Control Panel → Admin Tools → Services). The configuration file is located under C:\Program Files\Couchbase\Sync Gateway\serviceconfig.json. Logs are located under C:\Program Files\Couchbase\Sync Gateway\var\lib\couchbase\logs. From here, there are two installation options. Launch the sync_gateway program from the command line. Unpack the tar.gz installer to the /opt directory. Create a new macOS user. If the operation is successful, you will get the following output. sysadminctl No clear text password or interactive option was specified (adduser, change/reset password will not allow user to use FDE) ! Create a new group and add the sync_gateway user to that group. Run Sync Gateway as a service with the following. Other scripts in that directory are available to update or uninstall the service. Sync Gateway is now reachable on 0.0.0.0:4984. The configuration file and logs are located in /Users/sync_gateway. The following sections describe how to install and configure Sync Gateway to run with Couchbase Server. Public port. External HTTP port used for replication with Couchbase Lite databases and other applications accessing the REST API on the Internet. Admin port. Internal HTTP port for unrestricted access to the database and to run administrative tasks. To configure Couchbase Server before connecting Sync Gateway, run through the following. Download and install Couchbase Server. Open the Couchbase Server Admin Console on http://localhost:8091 and log on using your administrator credentials. In the toolbar, select the Buckets tab and click the Add Bucket button. Provide a bucket name, for example staging, and leave the other options to their defaults. 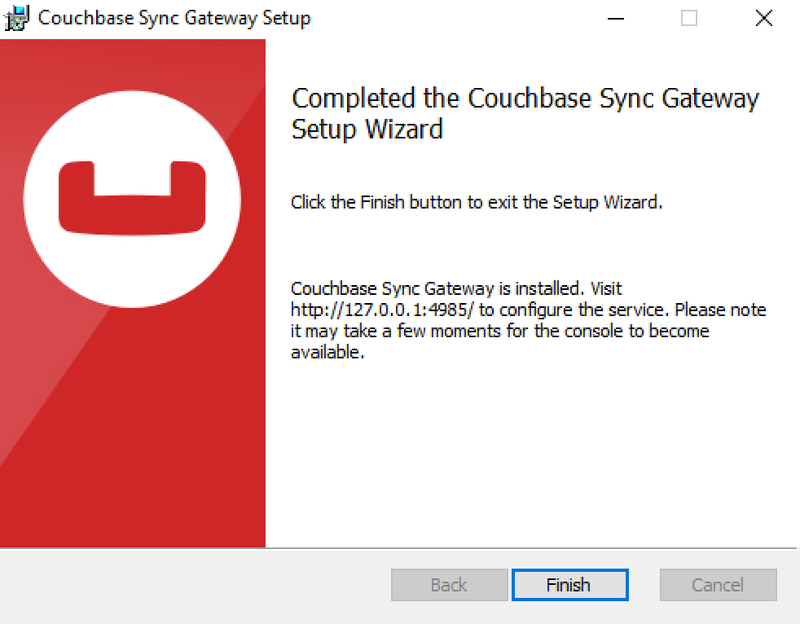 In order for Sync Gateway to connect to Couchbase Server, you must create an RBAC user. The RBAC user credentials will be used in a later section to start Sync Gateway. Open the Security tab and click the Add User button. The steps to create the RBAC user differ slightly depending on the version of Couchbase Server that you have installed. We explain the differences below. In the pop-up window, provide a Username and Password, those credentials will be used by Sync Gateway to connect later on. Next, you must grant RBAC roles to that user. If you are using Couchbase Server 5.5, you must enable the Application Access and Read Only Admin roles. In the pop-up window, provide a Username and Password, those credentials will be used by Sync Gateway to connect later on. Next, you must grant RBAC roles to that user. 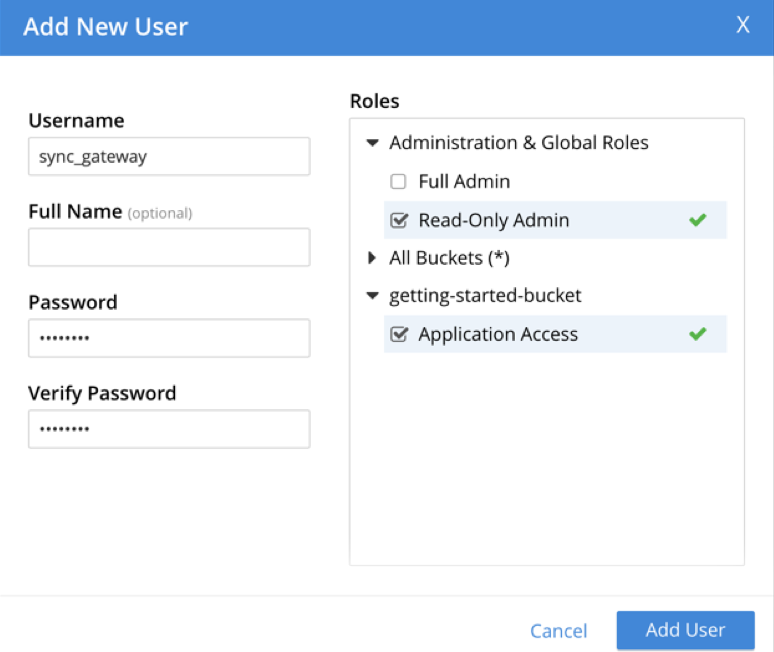 If you are using Couchbase Server 5.1, you must enable the Bucket Full Access and Read Only Admin roles. If you’re installing Couchbase Server on the cloud, make sure that network permissions (or firewall settings) allow incoming connections to Couchbase Server ports. In a typical mobile deployment on premise or in the cloud (AWS, RedHat, etc. ), the following ports must be opened on the host for Couchbase Server to operate correctly: 8091, 8092, 8093, 8094, 11207, 11210, 11211, 18091, 18092, 18093. You must verify that any firewall configuration allows communication on the specified ports. If this is not done, the Couchbase Server node can experience difficulty joining a cluster. You can refer to the Couchbase Server Network Configuration guide to see the full list of available ports and their associated services. 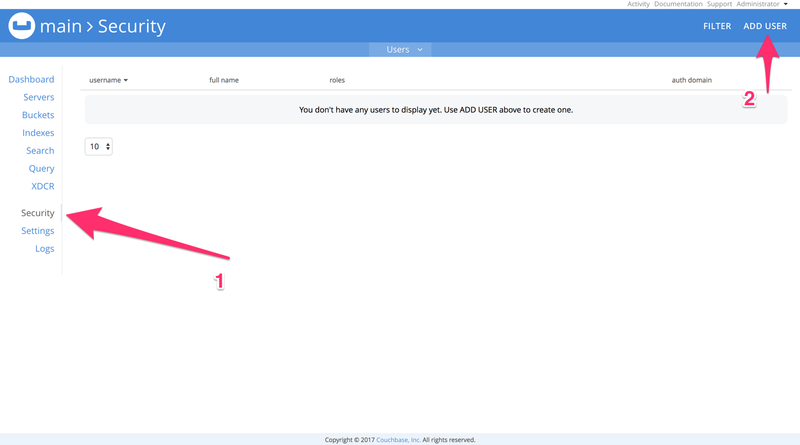 The following steps explain how to connect Sync Gateway to the Couchbase Server instance that was configured in the previous section. Open a new file called sync-gateway-config.json with the following. This configuration contains the user credentials of the sync_gateway user you created previously. 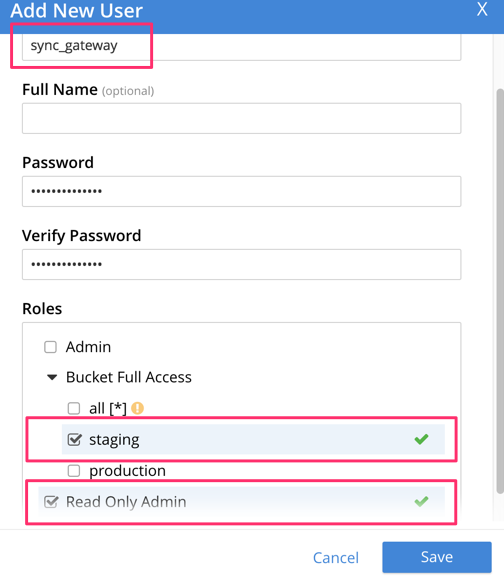 It also enables shared bucket access; this feature was introduced in Sync Gateway 1.5 to allow Couchbase Server SDKs to also perform operation on this bucket. Start Sync Gateway from the command line, or if Sync Gateway is running in a service replace the configuration file and restart the service. Run the application where Couchbase Lite is installed. 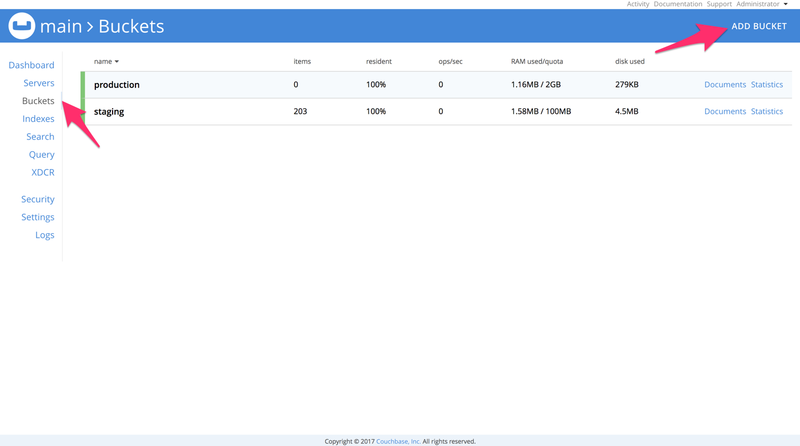 You should then see the documents that were replicated on the Sync Gateway admin UI at http://localhost:4985/_admin/.